Hosted at Colshaw Hall in Upper Peover this 10k follows leafy Cheshire lanes in a circular route, passing the iconic Lovell telescope at Jodrell Bank. With just over a 1000 runners this was a popular run with local clubs, on what was a busy weekend in the race calendar with Hyde and Marple taking place on the same day. 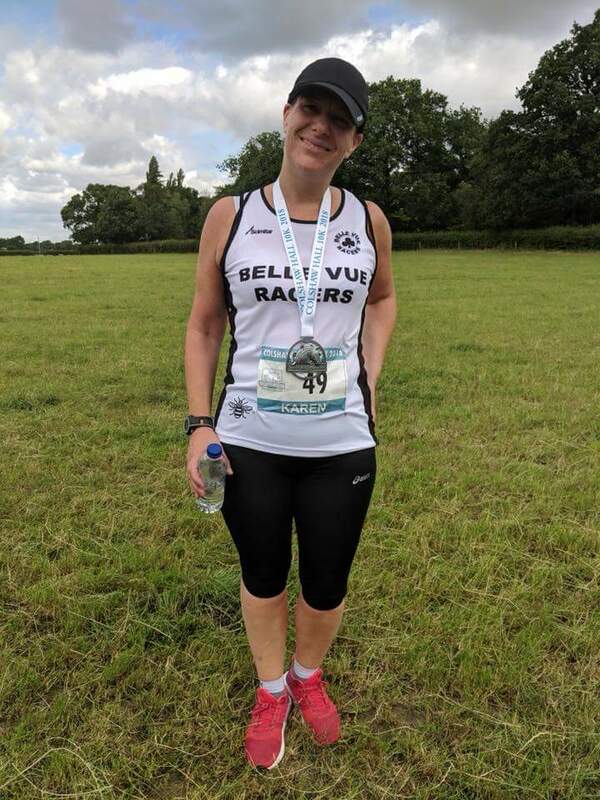 A single BVR runner took part (new member Karen), concentrating on running a steady pace following an epic heat-related fail at Anderton the previous month. Really enjoyed the run, which was well supported by those in the few (very swanky) houses along the route. 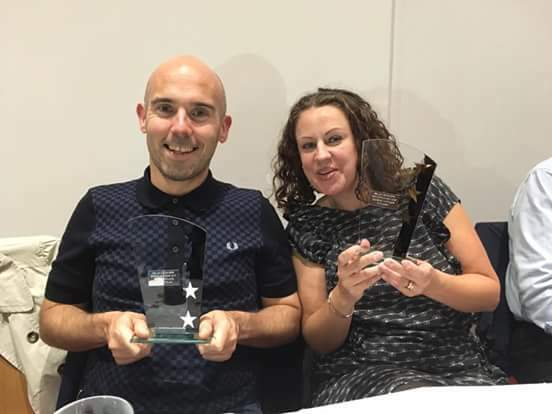 Congratulations to our Men’s and Women’s Champions for the 2017-18 Autumn / Winter season – Derrick Watson and Kath Horwill. In the men’s competition, it was Men’s Captain Patrick O’Brien who was squeezed into the second spot with Phil Wilcoxon taking third. Among the women, Ruth Amin took the runner’s up spot while Julia Foy and Annie Hirsch tied for third. Our progress award went to Elaine Mottershead. Congratulations to all runners who completed the season! Belle Vue Racers’ own living legend, Andy Wood, was recently presented with a Special Achievement Award by the club, to mark his completion of fifty marathons. Halfway to a century of 26.2s and a constant inspiration, well done Andy! Pictured here with our Honorary Chair Lynda Guy and Club Secretary Ruth Amin. Congratulations to our Men’s and Women’s Champions for the 2017 Spring/Summer season – Damien Tolan and Ruth Amin. In the men’s competition, it was Andy Wood who took second spot, with Ross Pettigrew, Patrick O’Brien, Derrick Watson and Vic Walsh caught in an unseemly skirmish for third place – just four points separating the four men – with Vic coming out on top to take the bronze. The women’s competition saw a familiar trio on the podium with Annie Hirsch taking second spot and Julia Foy third. Not far behind we saw Yana Anderton, Rachel Watson and Deborah Maskell leading the chasing pack, perhaps manoeuvring themselves for a tilt at the title next year? Congratulations to all runners who completed the season! Best of luck for the forthcoming season, starting at Congleton Half and Gin Pit 5 on Sunday. It was a beautifully sunny, late summer morning for Bollington 10k. This is one of the most scenic of all of our fixtures – resulting in sheer pleasure of being able to run. Marathon training Damien & Ruth had just come for a little ‘bimble’, revelling in what seemed like a short distance. Yana & Rachel joined them as a team of four hardy Belle Vue Racers. The course set off (& finished) at the leisure centre. The first 5k is very undulating, but never overwhelmingly steep for long. The route goes through Bollington centre, out to Pott Shrigley, where cyclists & runners merged harmoniously, & then on to the Middlewood Way for a couple of flat miles back to Bollington. The views are incredible at times & there’s lots to look at in terms of countryside & posh abodes. It’s a well marshalled course with good local support; chip timed with a decent medal thrown in. Wimbledon is here. School is almost out. Summer is here! So here, to rain on your parade, are some dates for the Autumn/Winter season. Brrrr! Manchester Area League: 14th October, 11th November, 2nd December, 13th January 2018, 10th February – more details to follow. 31st December – Bowstones Fell Race – Happy New Year! Full race calendar to follow. In the meantime, enjoy the sunshine! Scorchio! Ruth and Debbie versus the Freckleton Half Heat, and, again, with Linda, Andy and Lisa at Round the Resers. Annie, Vicky, Julia, Yana and Phoebe at Le Tour de Tameside – Coach Corrigan in the reflection! As ever, well done all. A runner’s high has a lot to answer for. Back in November after running the Snowdonia Marathon I persuaded Leah to sign up and join me for a Half Ironman. How hard could it be? We could both ‘probably’ do all three sports. After all, it’s only a 1.2 mile swim, 56 miles on the bike and a half marathon. It’s just a bit of practice, yes? Just sticking them all together. About the same time I was struck down with (undiagnosed) whooping cough. Joy. So Leah carried on training – and stormed her London Marathon, a mere 6 weeks before the Cotswold 113, our first middle-distance triathlon, and I eventually got better after 5 months. In April we (and Kath) both got into Salford Quays for the first time (brrrrrrr) and for one of us it was all about conquering fear of the murky depths. So here we are, early June and we’re in the Cotswolds. It’s 3.30 am and we’re up and getting ready for a 5 am transition set-up. Zzzzz. But it’s quite the buzz. There were some serious looking athletes as well as plenty of first-timers. We’re in the 6 am start wave and the water in the lake is positively balmy. 19.5 degrees. Happy days! Leah is super speedy and is one of the first out of the water, I’m one of the last but that’s OK. Six weeks ago I was hanging onto a buoy in The Quays in fear. Look how far I’ve come! The swim-bike transition was smooth – no wetsuit traumas! – and off we go for our bike ride. It’s flat and fast. Well as fast as we can cycle anyway. We were both overtaken by most of the field but I think it may have been because we didn’t have a pointy helmet. We both come in just over 3 hrs 20 mins but it felt like a long time to be on the road. The bike-run transition was just a quick change of shoes and off we go with calves that feel like they’re about to pop and Achilles Tendons taut like violin strings. Leah had a great run and finished in 6:02:44 and I was not too far behind in 6:26:59. Thanks to the generosity of friends, family and colleagues we both raised a lot of money for MNDA in memory of our friend Steve Mycio. Thank you to everyone who sponsored us. It was a great day and I don’t think either of us has ruled out doing a full one but I’m waiting for full or semi-retirement before that! Now. Where’s the Summer?? Lisa D.
Belle Vue Racers were represented at the London Marathon this year by Leah Evans and Annie Hirsch. Beautiful weather over the weekend of 22nd and 23rd April set the tone for a great event. Registration at the Excel on Saturday afternoon managed to get the nerves going a little. 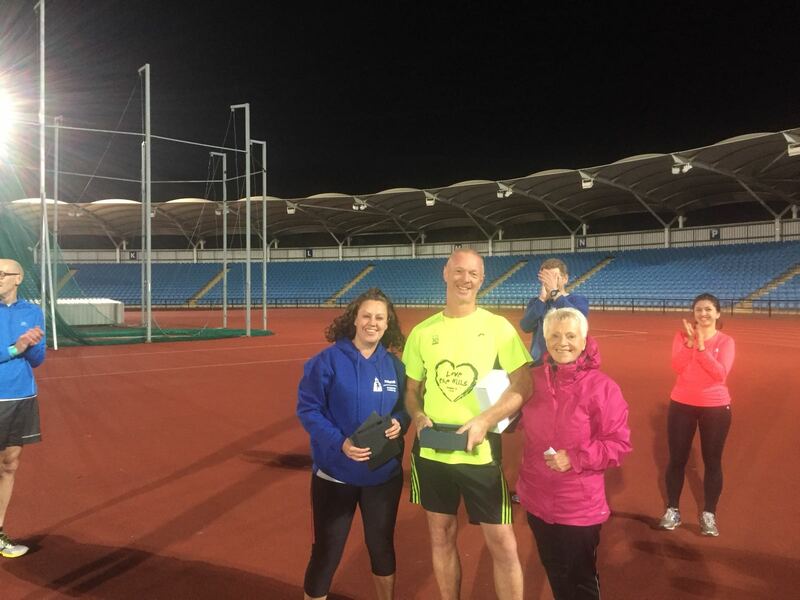 Annie managed to lose her envelope containing her number and timing chip in the crowds for a few minutes – which felt like quite a long time! Unfortunately for the BVRs they had different starting zones, Leah at Blue with all the elites and Royals whilst Annie was at the relatively quiet backwater of Green start. Having been packed onto busy trains full of marathon runners there was a short walk to the starting areas. However all the start zones had enormous toilet queues which did mean there was ample time to strike up new friendships whilst waiting. It was somewhat of a relief when the time reached 10 a.m – not that we could start running then as there is always a few minutes delay to crossing the start line – but to know that the main marathon had begun and soon we would be running was exciting. London marathon is rightly famous for the support from the crowds – it was very busy along the way which was particularly helpful over the last few miles. Leah and Annie were supported by family and friends and they made sure we saw them among the throngs. It is a great route through London streets which are not often not traffic free but filled with runners and supporters. Annie and Leah were pleased with their times – 3.56 and 4.01. At the finish we met up at the Motor Neurone Disease Association (mnda) meeting point where leg massages, cups of tea and nourishing food were all on offer. Leah and Annie were fundraising to support mnda in memory of BVR member Steve Mycio who died of the condition in 2016. Thank you to all BVRs for your support and generous donations. Hope you are all in the ballot for 2018!